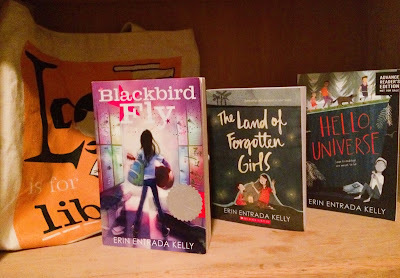 I am very happy to share an interview with Erin Entrada Kelly, Filipino American author of the excellent middle grade novels Blackbird Fly (Greenwillow Books, 2015), The Land of Forgotten Girls (Greenwillow Books, 2016) - one of the best middle grade novels I've ever read, Hello, Universe (Greenwillow Books, 2017), and the forthcoming You Go First (Greenwillow Books, 2018). Hello, Erin! To start, can you please tell us about your Filipino background? I am mestiza. My father is from the US. My mother is from Sogod, Southern Leyte, and lives in Cebu. What are the five books that turned you into a writer? It’s hard to pinpoint five books. I’ve always been a big reader. When I was about seven or eight, I realized that books were just pen and paper, which meant that I could write my own stories. That’s when I started writing. I’ve been writing for so long that I don’t remember a time in my life when I wasn’t working on something. So I guess I never turned into a writer—I was born that way! Now, for a more practical answer: The book that helped me improve most as a writer was Self-Editing for Fiction Writers by Renni Browne. I’ve read lots of books about writing, and this was by far the best. My path to publication started with short stories. The first story I ever published was a modern-day fairy tale. It was picked up by Story Philippines, which was a great honor because the work in Story Philippines was consistently excellent—it exceeded any of the short story magazines I read in the States, and I was disappointed when it ended its run. After that, more of my short stories were picked up by print and online magazines in the US, Philippines and beyond. I was a finalist for the Philippines Free Press Award for Short Fiction and my work appeared in Kyoto Journal, Monkeybicycle, Keyhole Magazine, and elsewhere. Writing and publishing short stories taught me a lot about what kind of novelist I was and wanted to be. I found my voice, learned how to submit work and accept feedback and rejection, and honed my skills. When I finished the original draft of Blackbird Fly, I was offered representation within two weeks. The book sold to Greenwillow Books, an imprint of HarperCollins, and I’ve been with the Greenwillow family ever since. Can you please share your creative process? All my novels start with a character and grow from there. Character is central to everything I write. Some writers build characters into their stories. I build my stories around my characters. I spend a lot of time in my head, getting to know everyone. Once the story comes together, I jot it down and tease it out. I write a summary, character sketches, chapter outlines. I draw doodles, print pictures, and sketch for inspiration. Everything happens in a notebook. 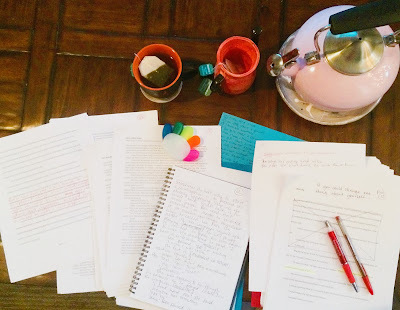 Most of my first draft is in longhand. I don’t schedule time to write; I only write when I feel like it. Luckily, I always feel like it. Aren't Blackbird Fly and The Land of Forgotten Girls the very first Filipino American middle grade novels?! Where were books like these when I was 12 years old?! That’s a good question! I don’t know. I haven’t encountered any others, but there are so many great books out there; it’s hard to keep up. I hope they aren’t the first—Filipinos have been an important part of American culture for so long. I know of Filipino American picture books and YA novels. I'm pretty sure your books are the first Filipino American middle grade novels. Dear readers, if I'm wrong, please correct me in the comments section! Erin, as a writer, what are your ten essentials? 1. A notebook, either unlined or college-ruled. I’m very particular about my notebooks. 2. Good pens of varying colors. I’m also particular about pens. Right now I prefer the Bic Cristal, which is an inexpensive ballpoint with a smooth glide. Unfortunately Cristals have a tendency to leak. But I take my chances. 3. Three-dimensional characters to write about. 4. A fluid outline. I think of it as a roadmap that can change at any moment. 6. Bookshelves packed with books. 7. 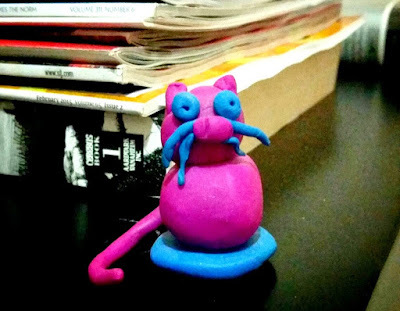 Professor Purple—a little clay cat that my partner made for me. Professor Purple is less than an inch high, but he keeps watch to make sure I stay on track. 10. Classical music, especially Chopin and Beethoven. 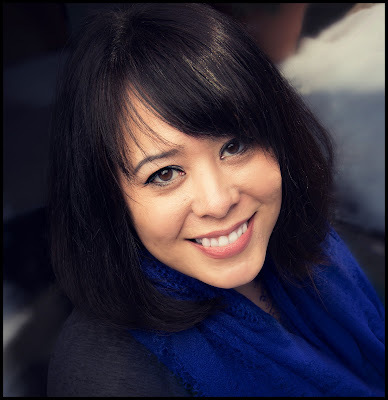 Congratulations on winning an Asian/Pacific American Award for Literature for The Land of Forgotten Girls! What does this award mean to you? This award means a lot to me. I'm overwhelmed and honored to receive it and thrilled that an award exists to bring more attention to Asian American literature and writers. It's particularly meaningful because it comes from people within the Asian Pacific community. The fact that they've embraced my work and want to recognize it is one of the proudest moments of my career thus far! Please tell us about Hello, Universe, your latest book. And what are you currently working on? Hello, Universe is told from the perspective of four characters—shy and self-conscious Virgil Salinas (a Filipino who loves his Lola's folktales! ); his crush Valencia Somerset, who is clever and stubborn; Kaori Tanaka, their "psychic advisor"; and Chet Bullens, the neighborhood bully. Virgil seeks Kaori's help because he doesn't know how to talk to Valencia. He's shy and he's nervous because Valencia is deaf and he isn't sure how to approach her. This sets off a series of events that all come to a crosshairs on one fateful Saturday. It's a contemporary novel, but there are elements of magical realism throughout. I'm currently finishing edits on my fourth book and outlining a new novel, which is greatly inspired by Filipino folklore. Erin, thank you so much for taking the time to answer my questions!